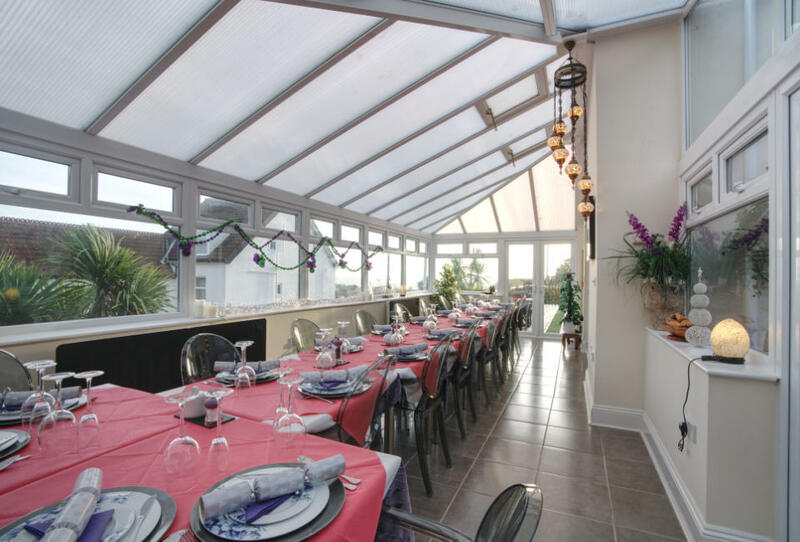 The large conservatory/dining room provides views of all aspects and the panoramic sea views from the adjoining balcony are not to be missed whether you are eating breakfast al-fresco, or having early evening drinks. 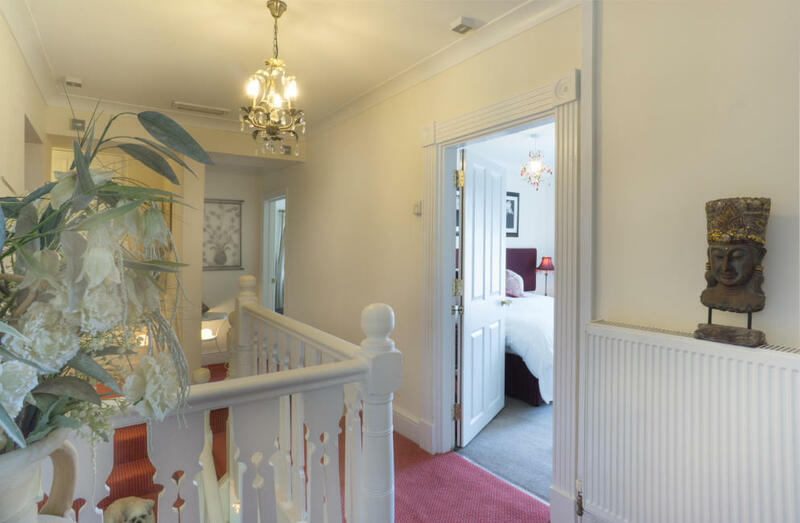 Westwood’s boutique style is carried throughout the house with 8 contemporary and comfortable en-suite bedrooms, each sumptuously furnished with a unique style and ambiance. 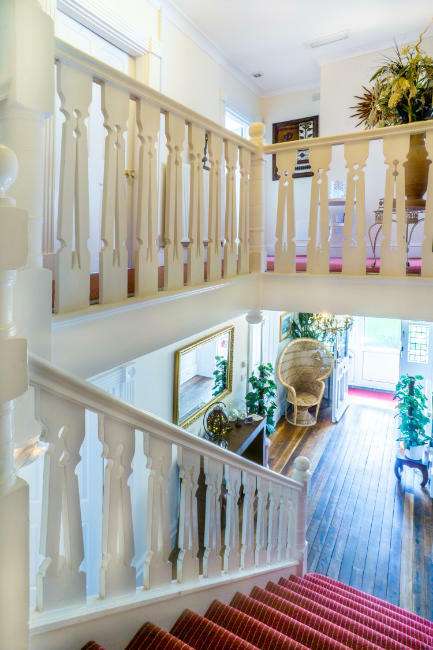 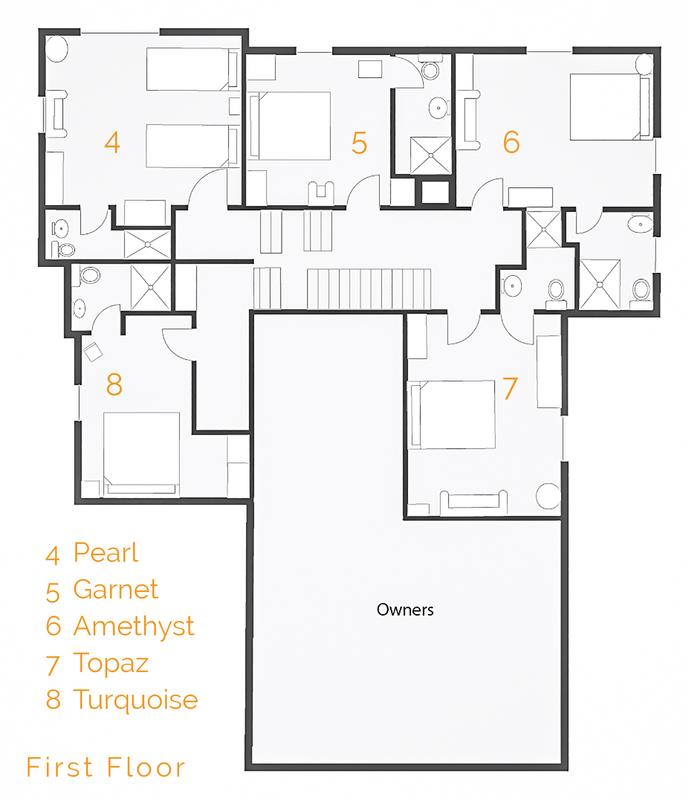 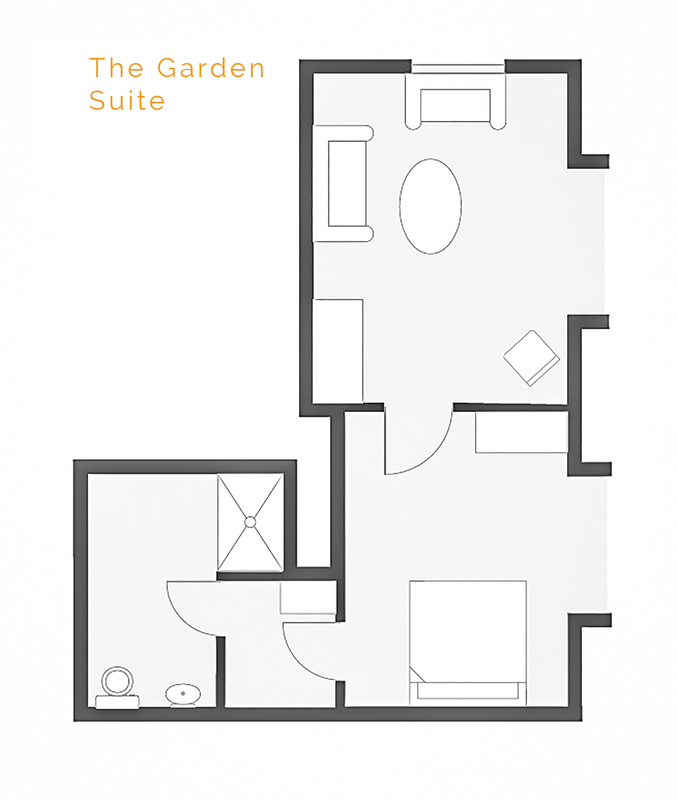 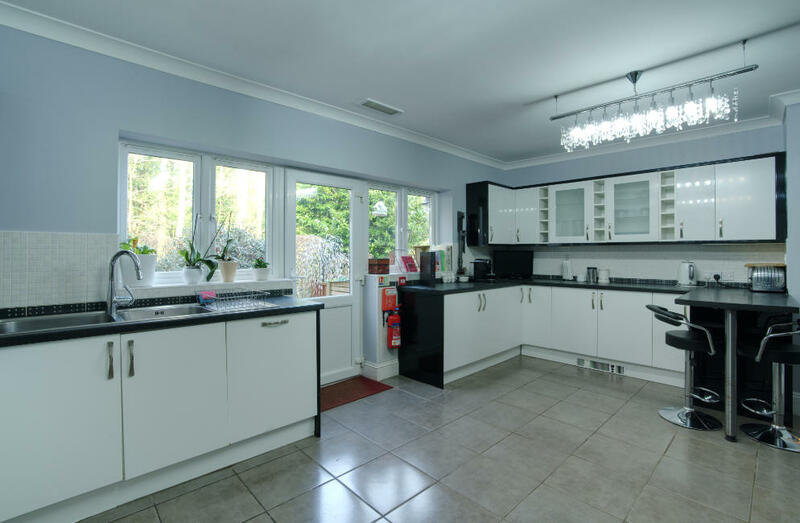 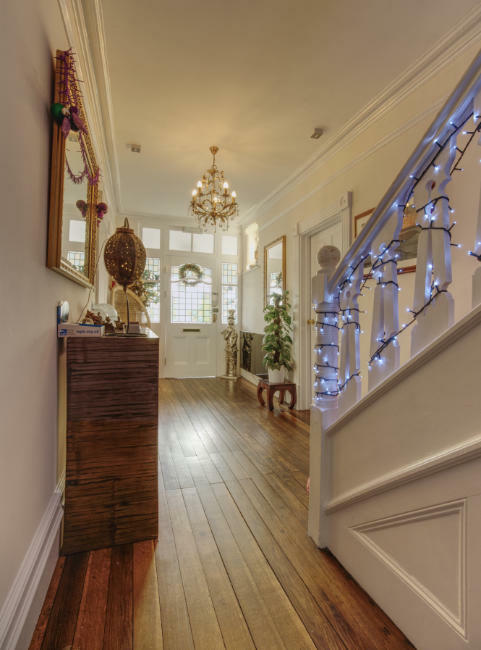 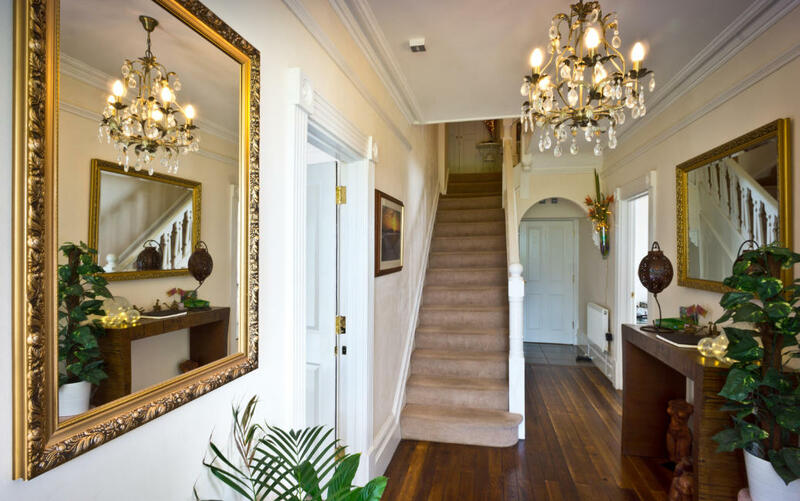 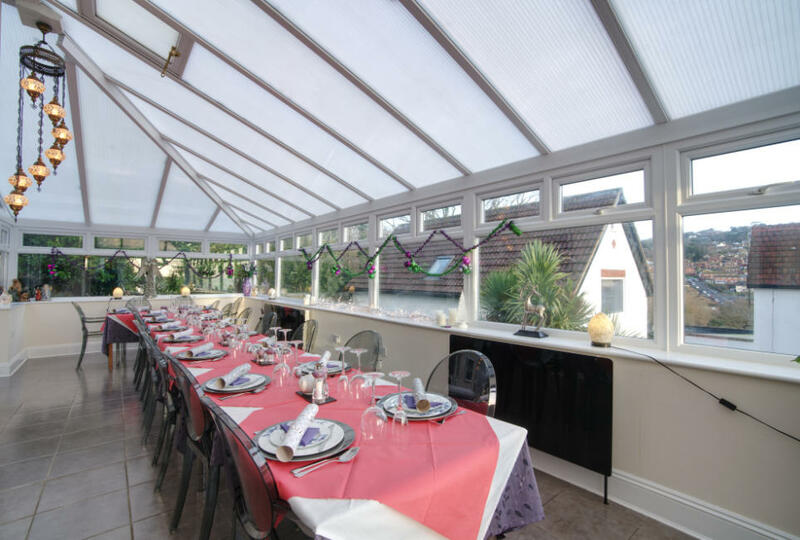 We have a large, luxury kitchen and a conservatory/dining room, a living room and a garden with outside terraces and seating areas. 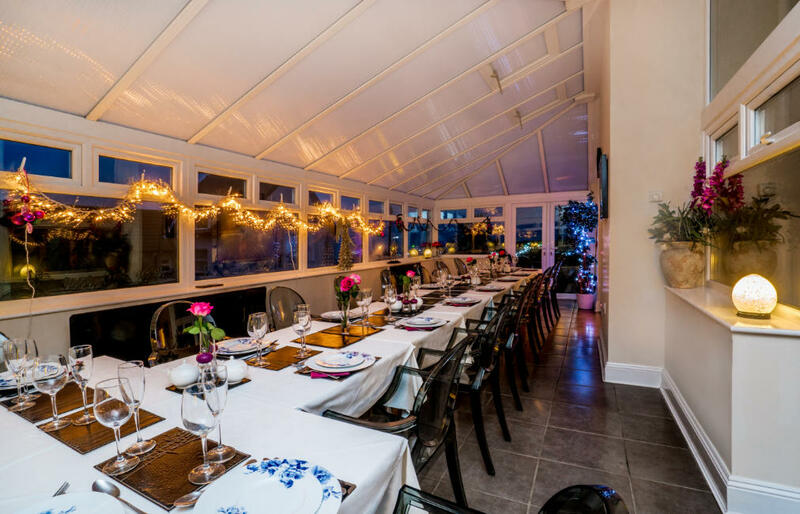 We are fully equipped for self catering but can connect you to outside caterers on a basis to suit you and your party if you prefer. 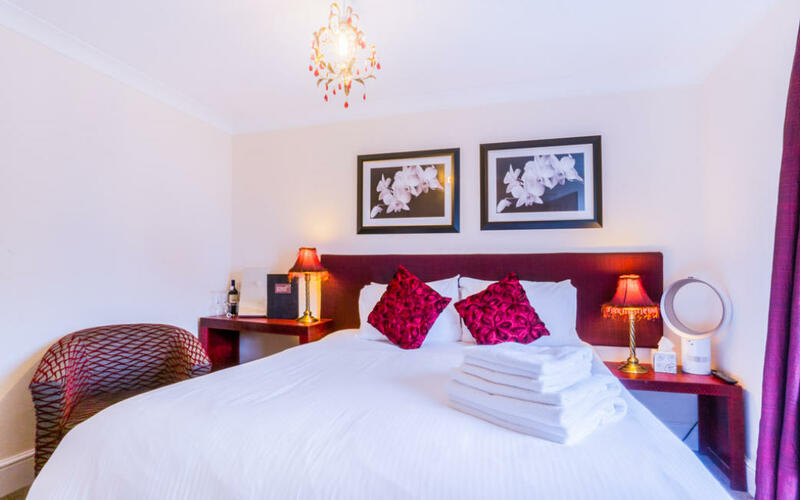 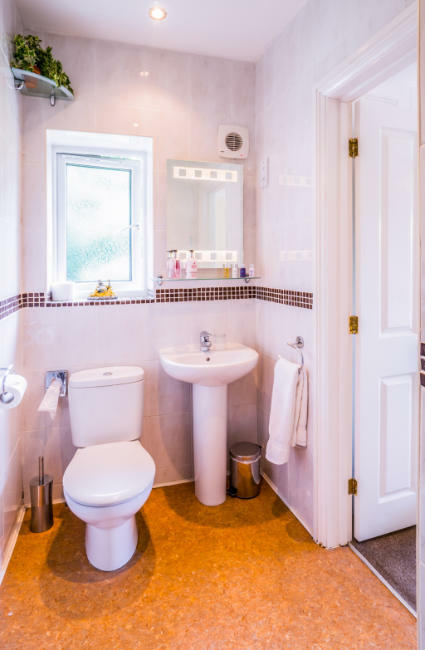 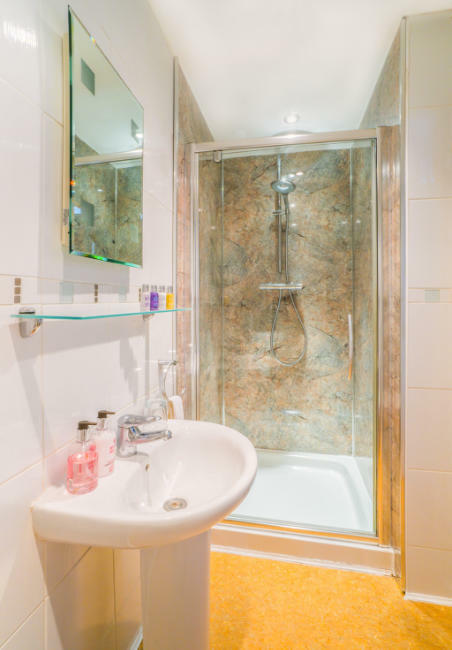 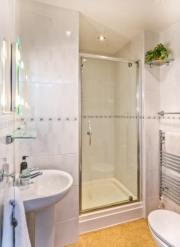 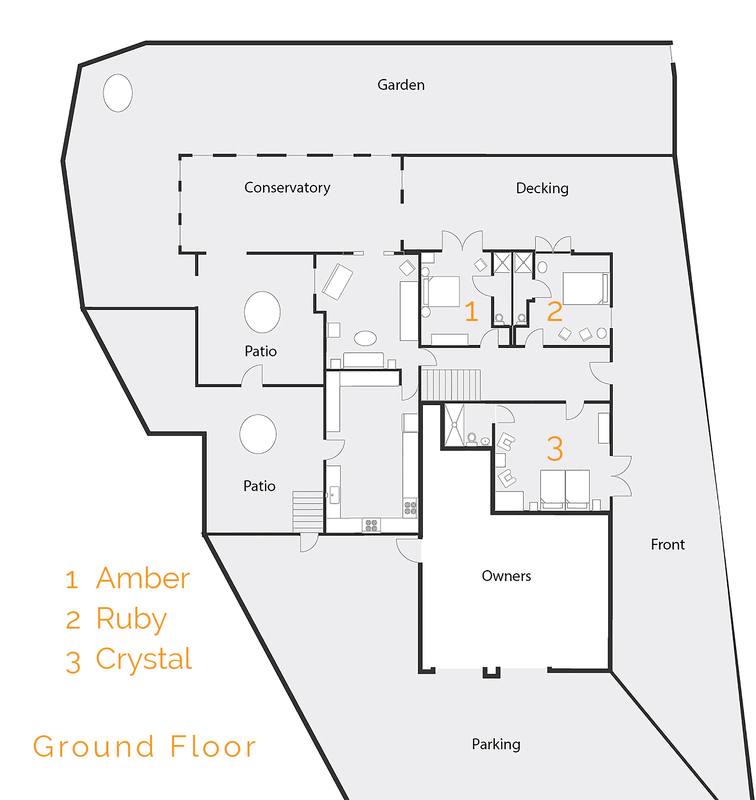 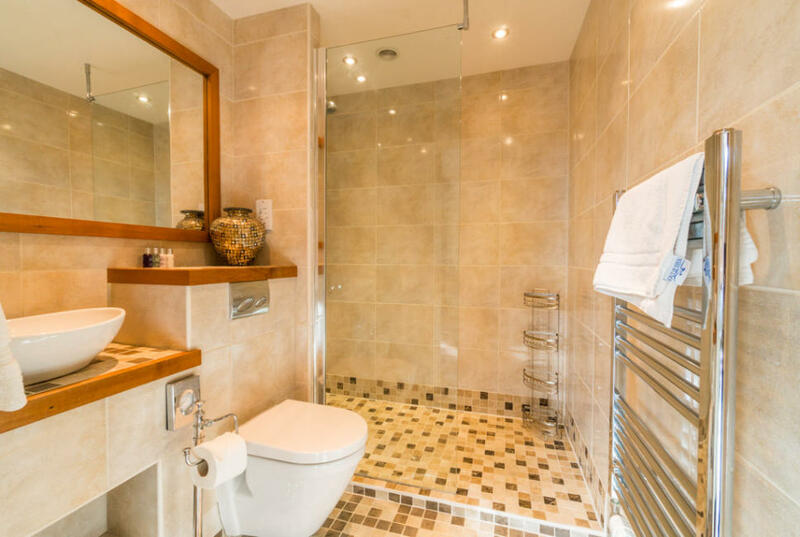 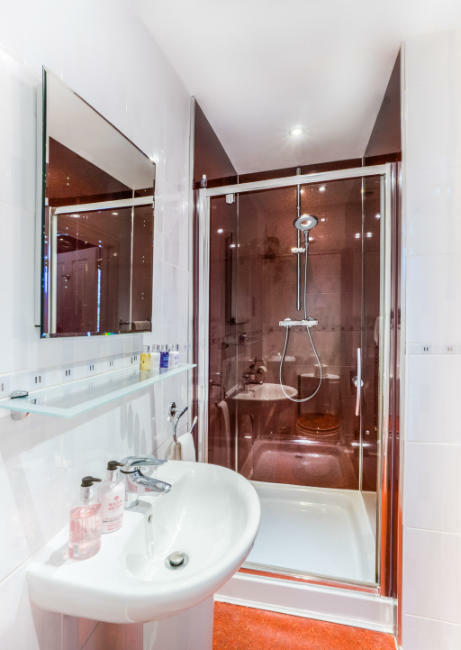 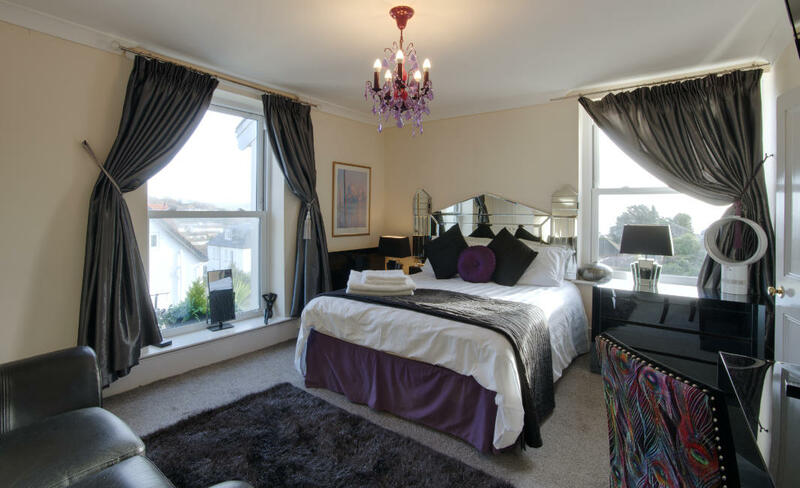 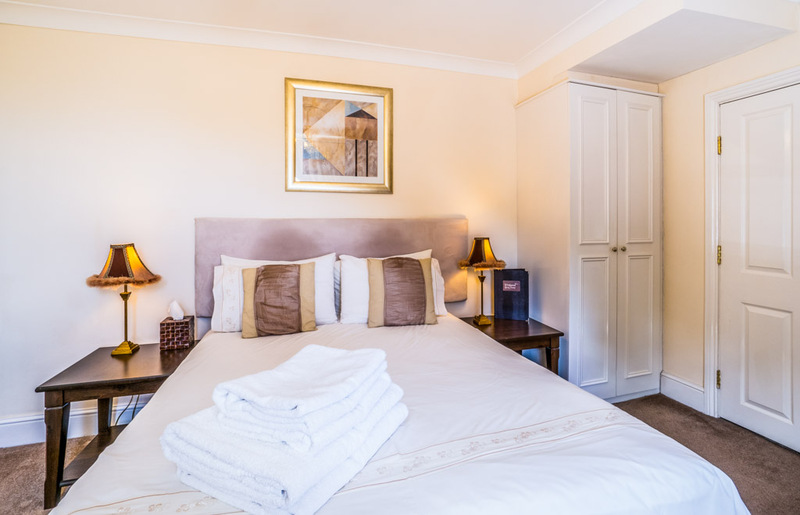 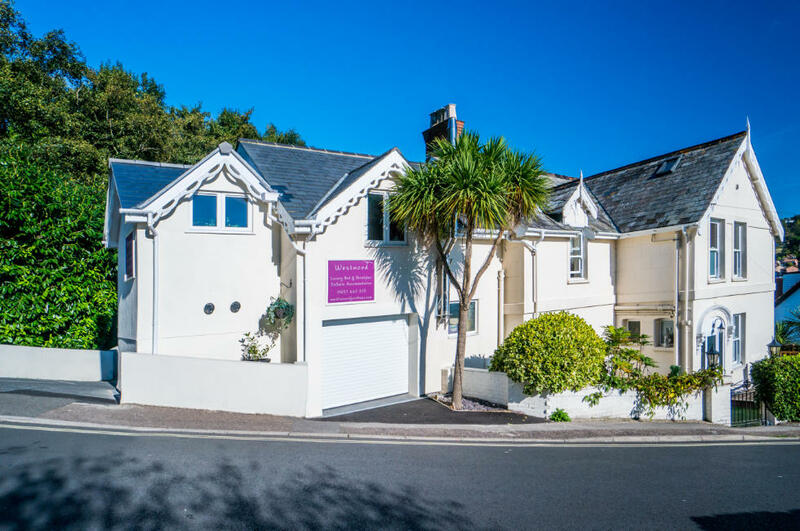 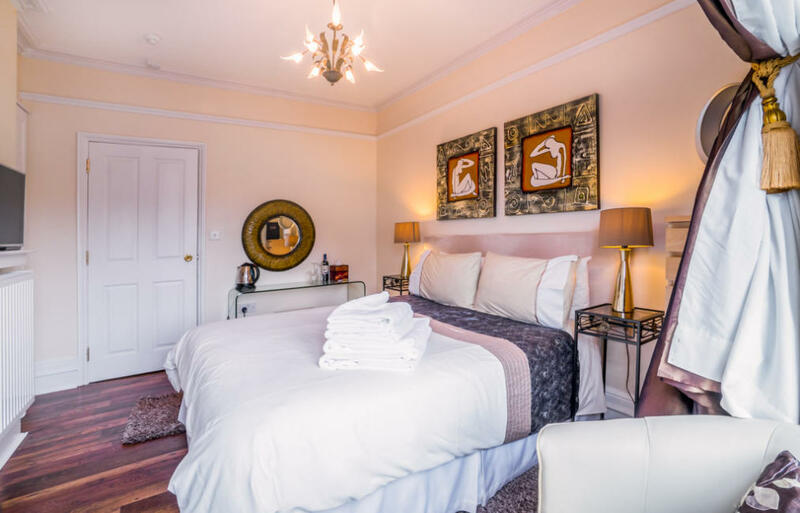 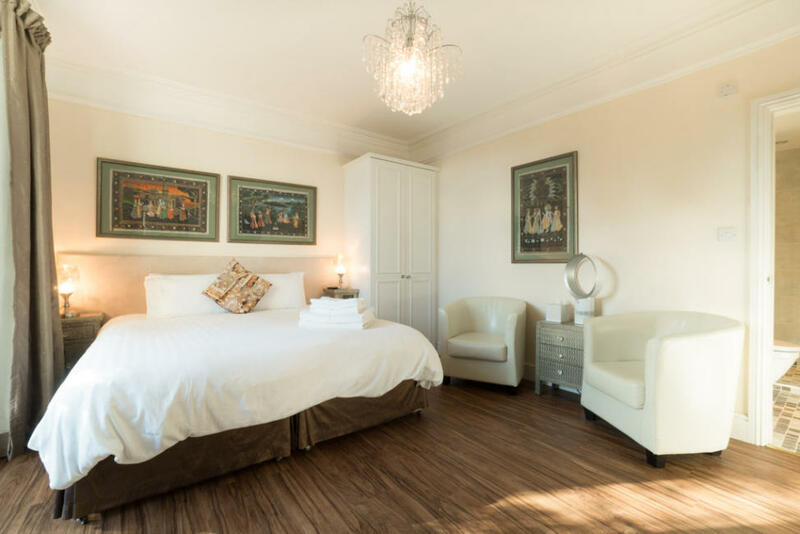 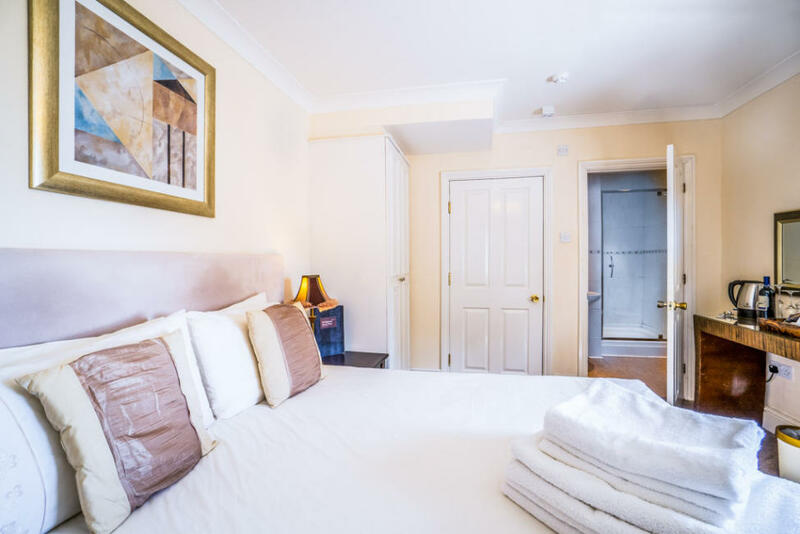 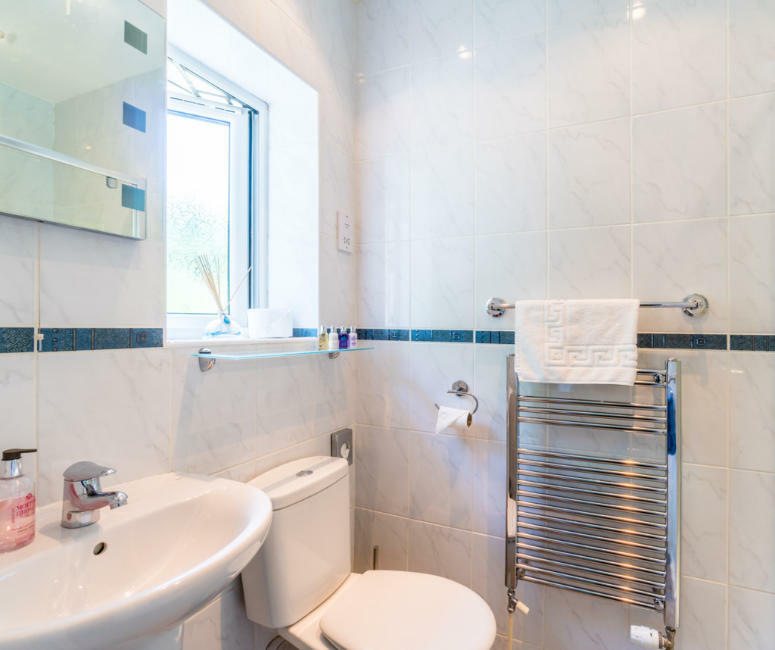 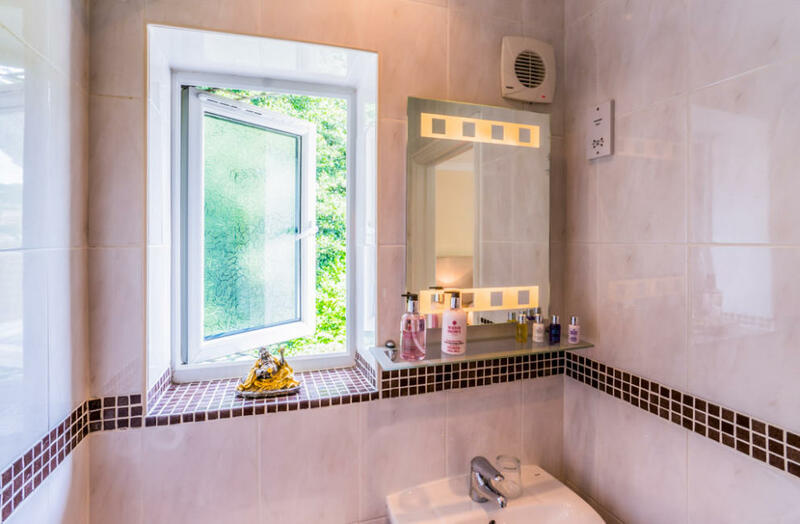 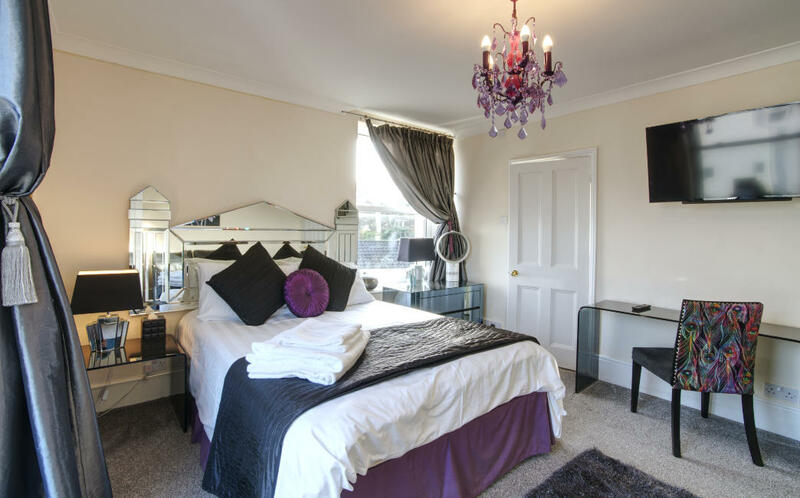 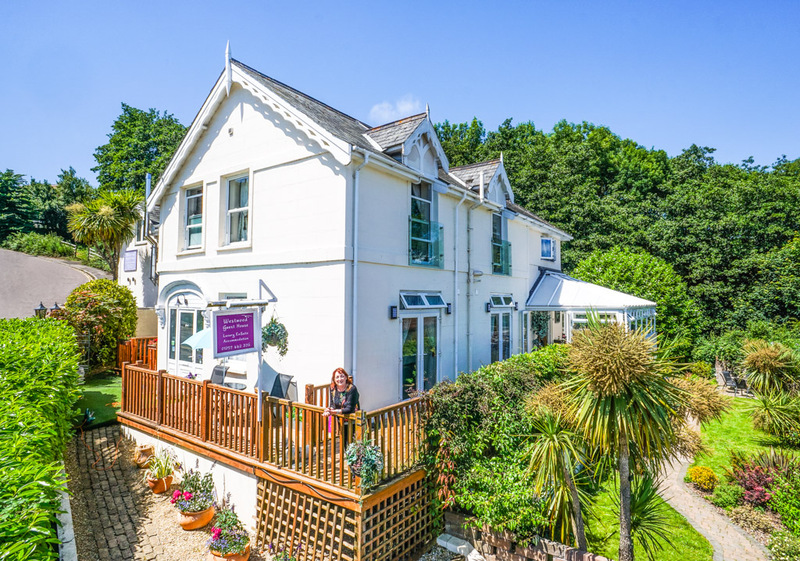 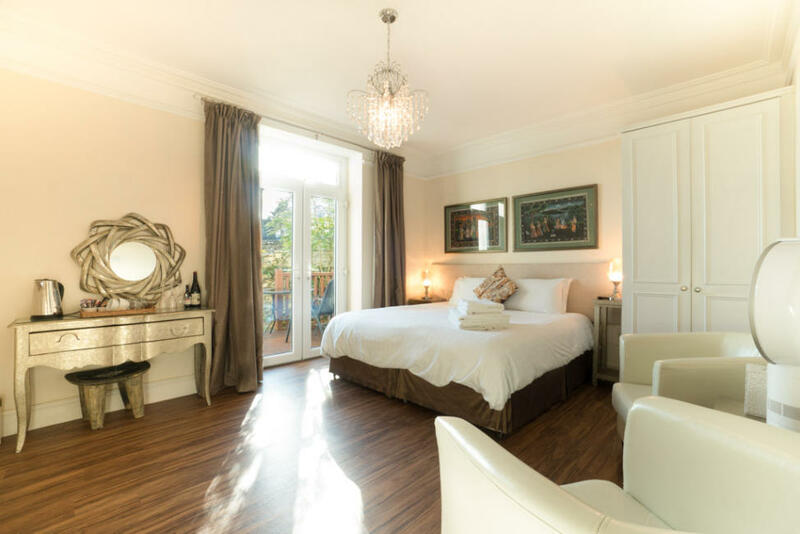 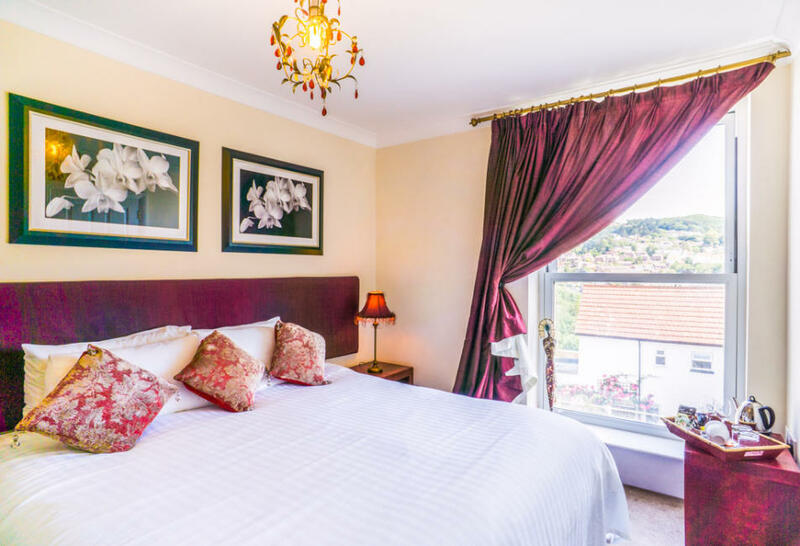 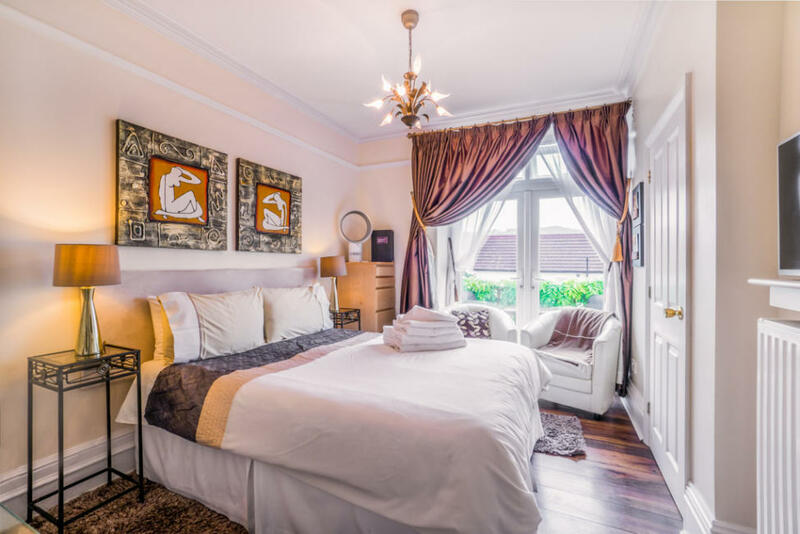 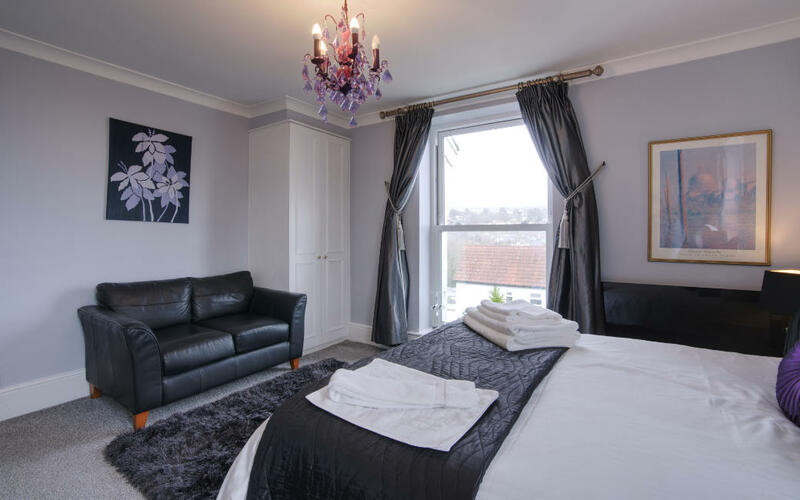 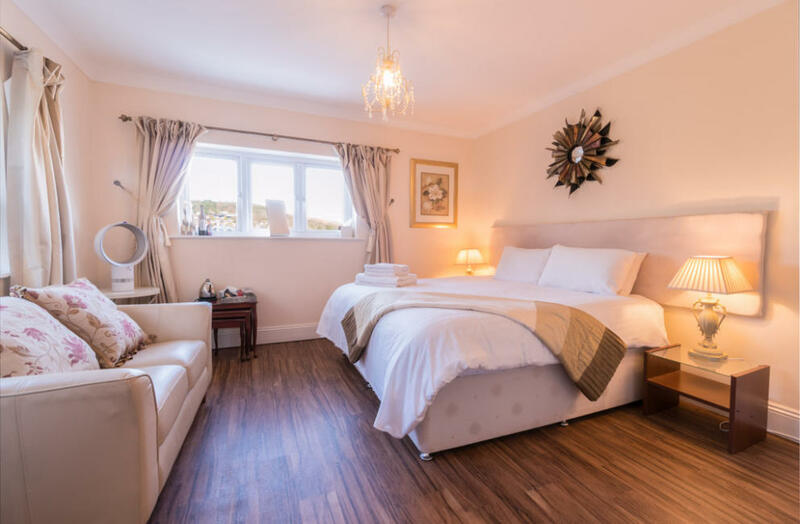 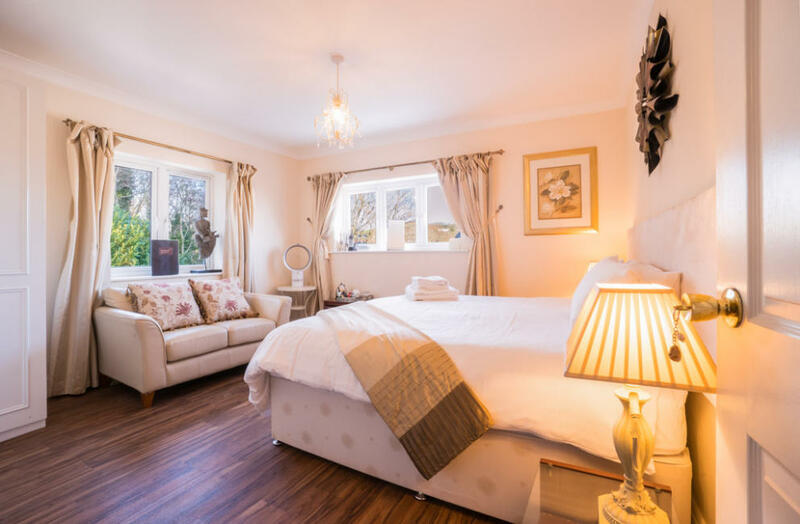 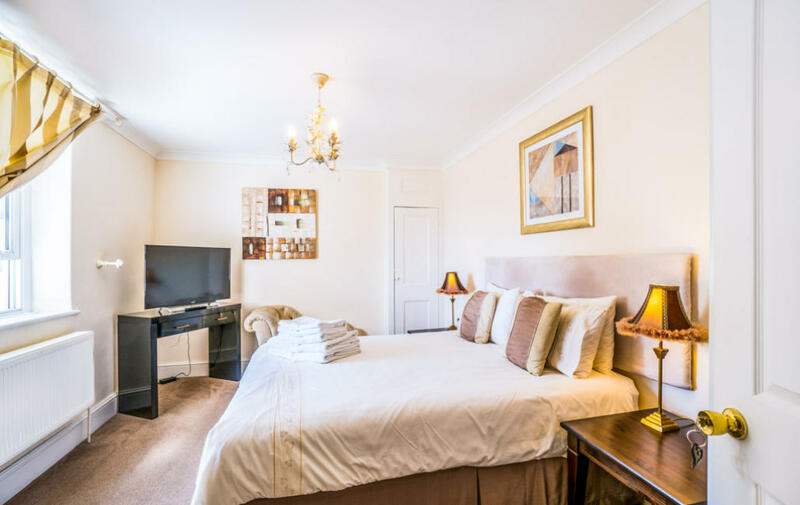 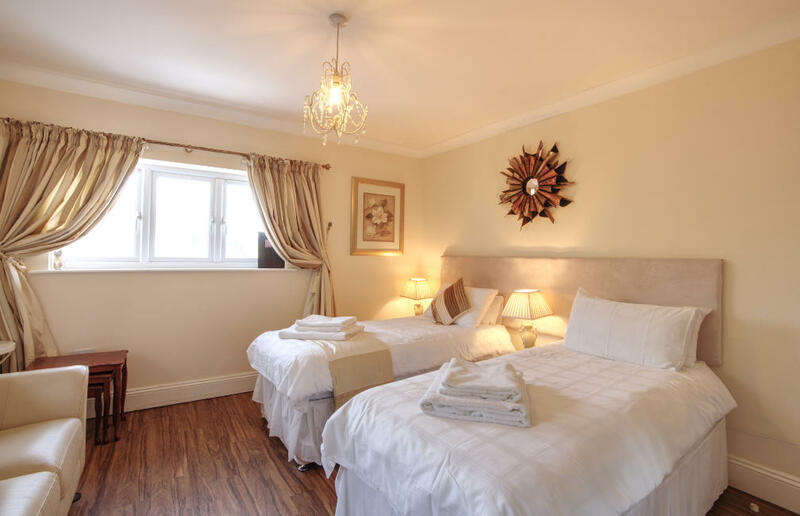 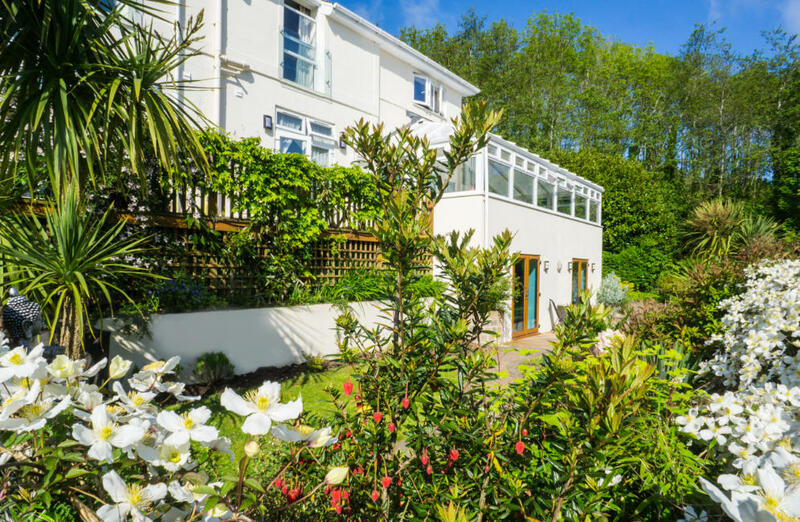 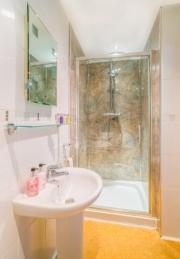 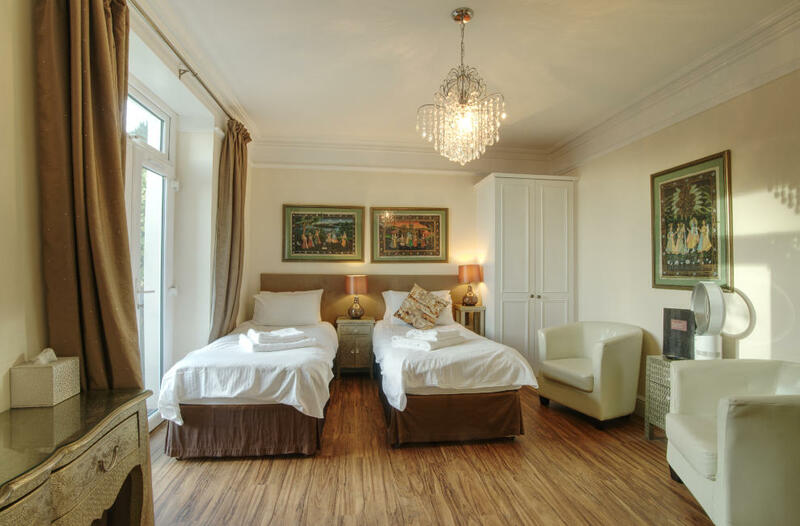 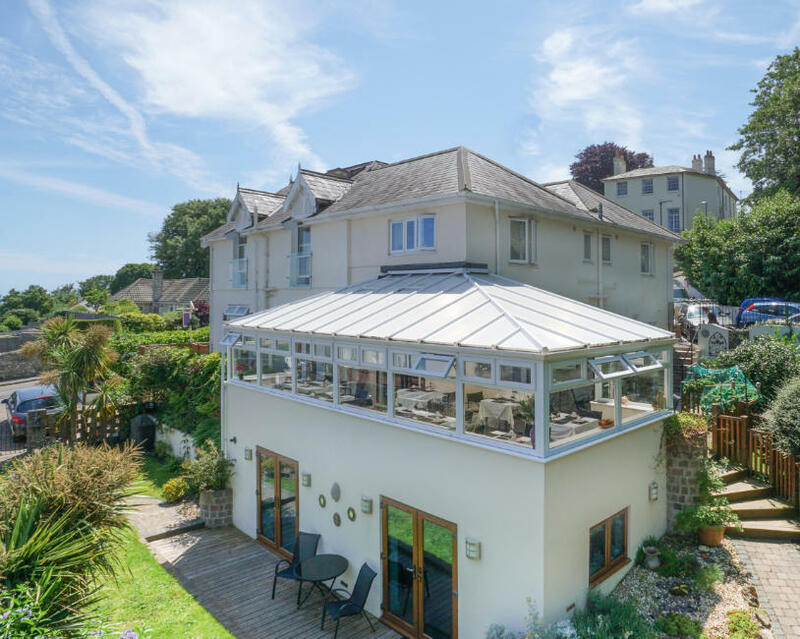 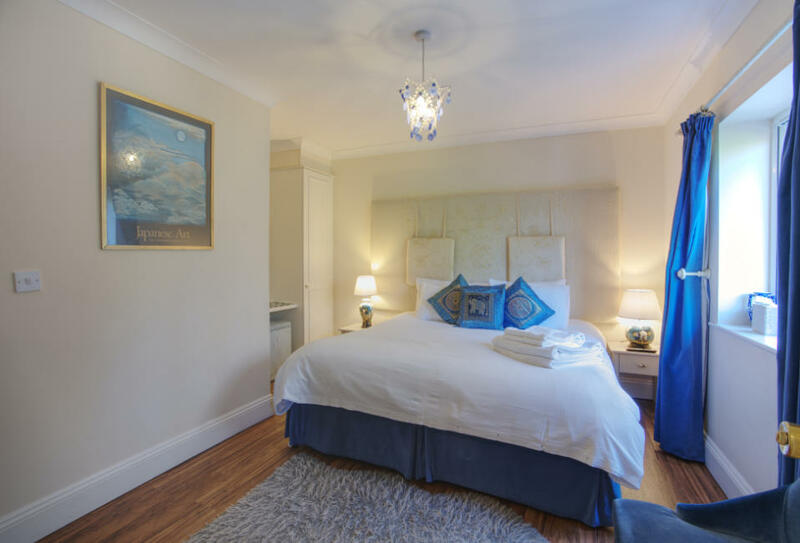 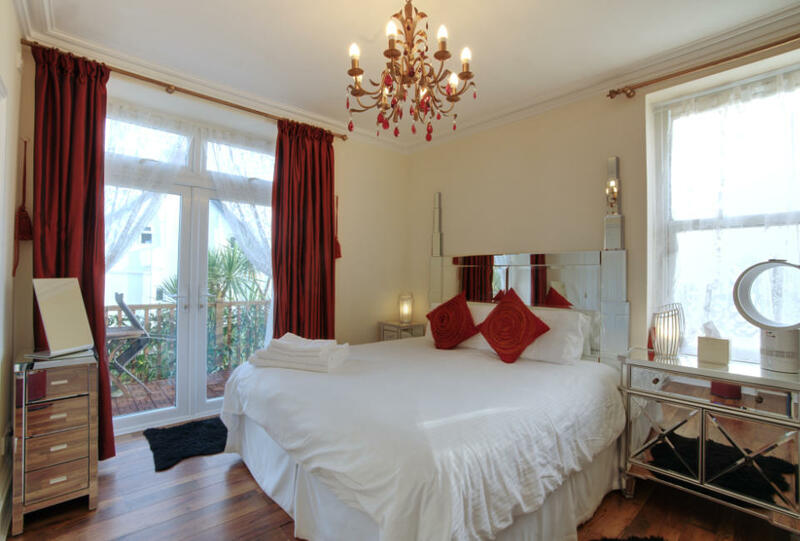 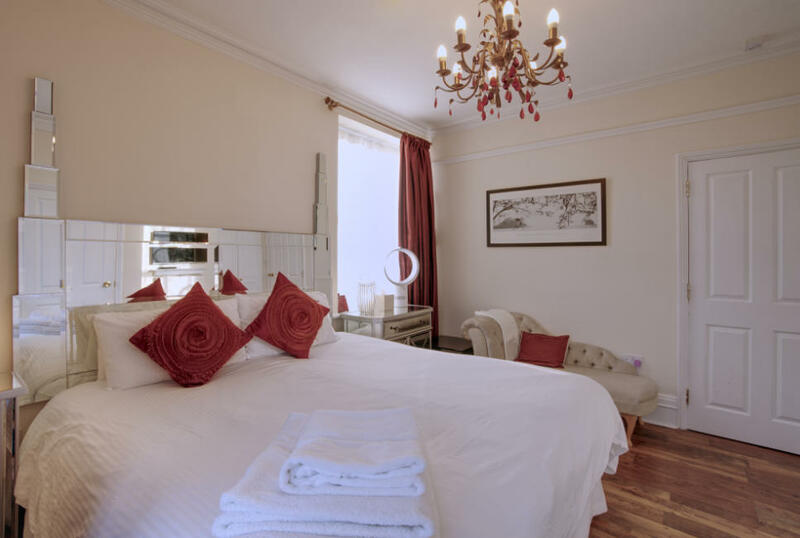 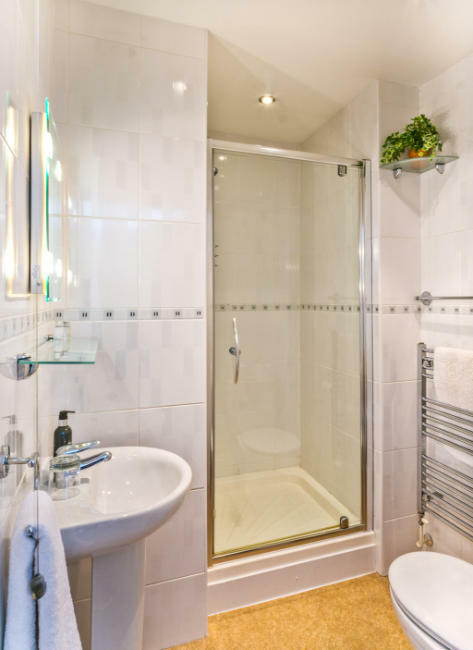 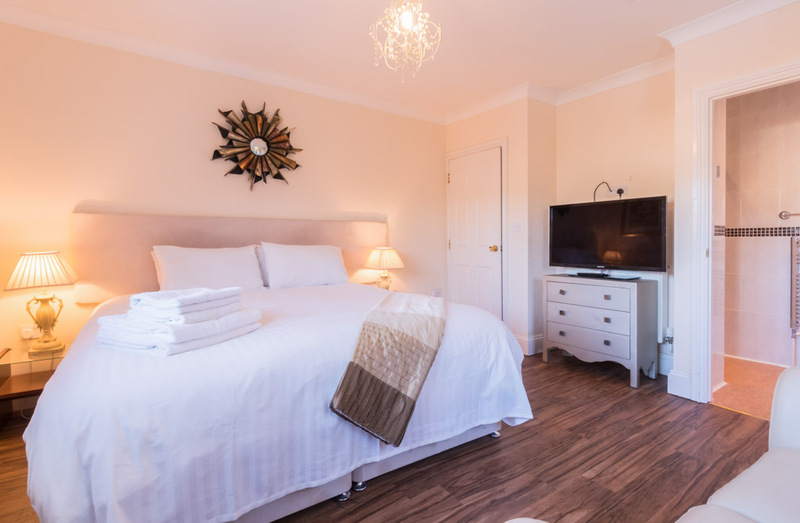 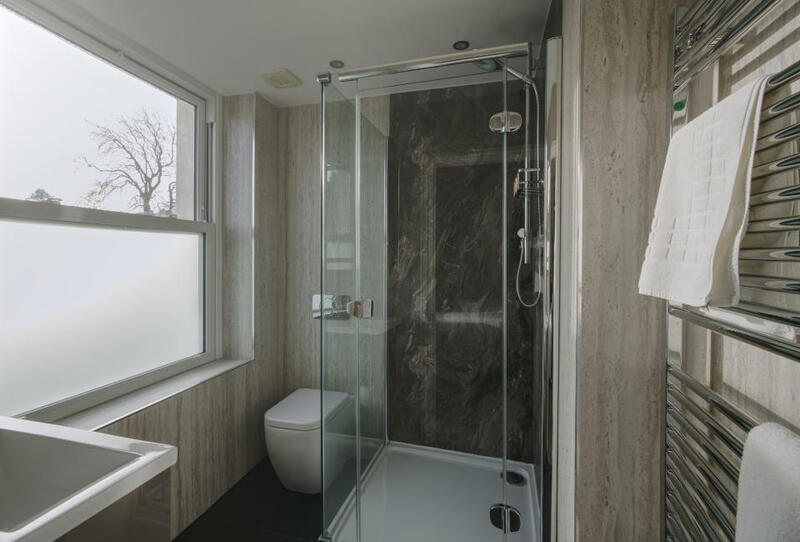 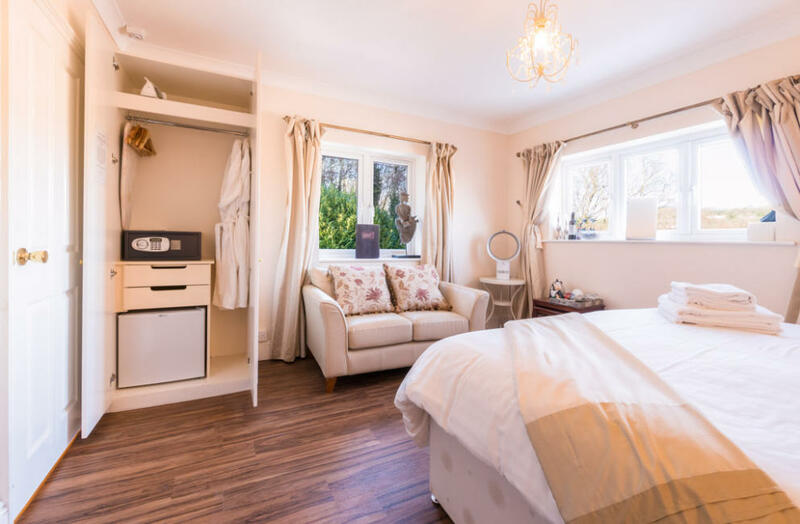 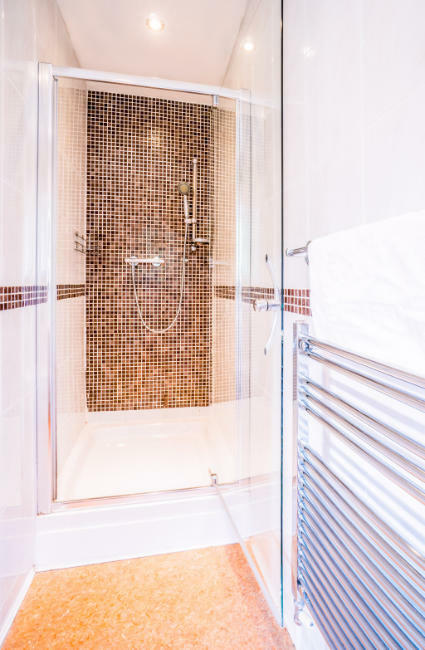 There are 8 contemporary en-suite bedrooms, 7 with sea views and 1 with a woodland view, 4 of the bedrooms have super king size beds which can also be separated to make twin rooms if required, extra Z-beds are available. 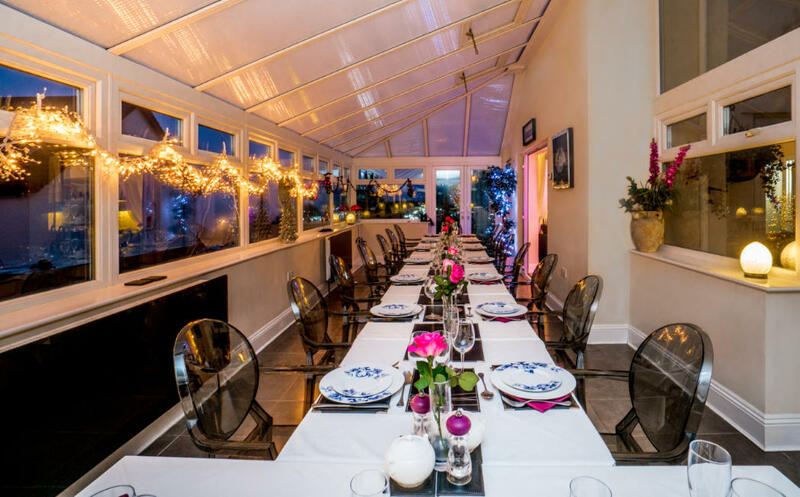 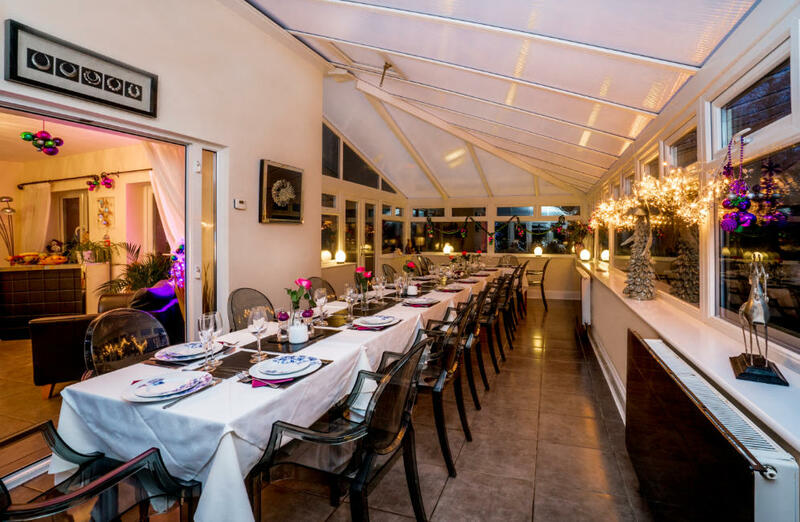 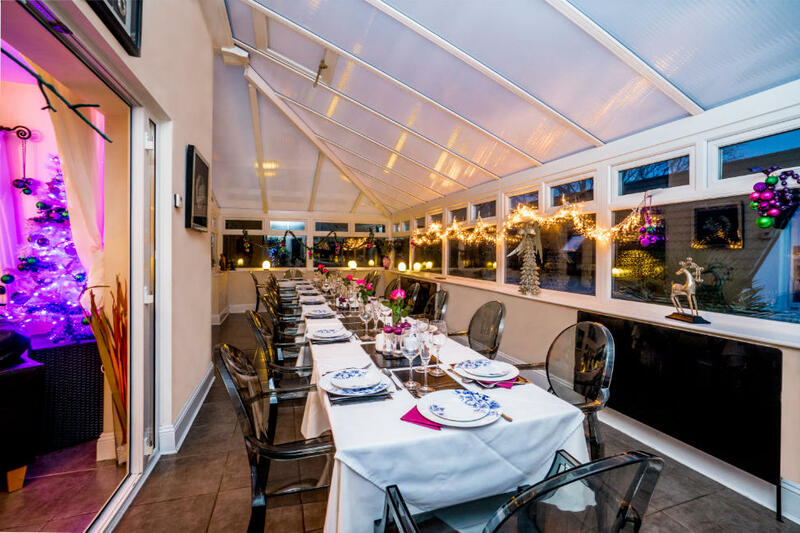 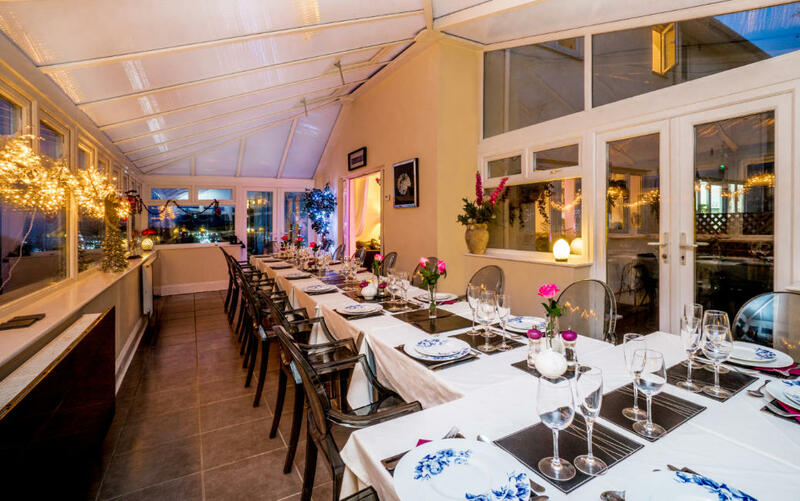 The conservatory/dining room comfortably seats 16 with but can seat up to 20 if required. 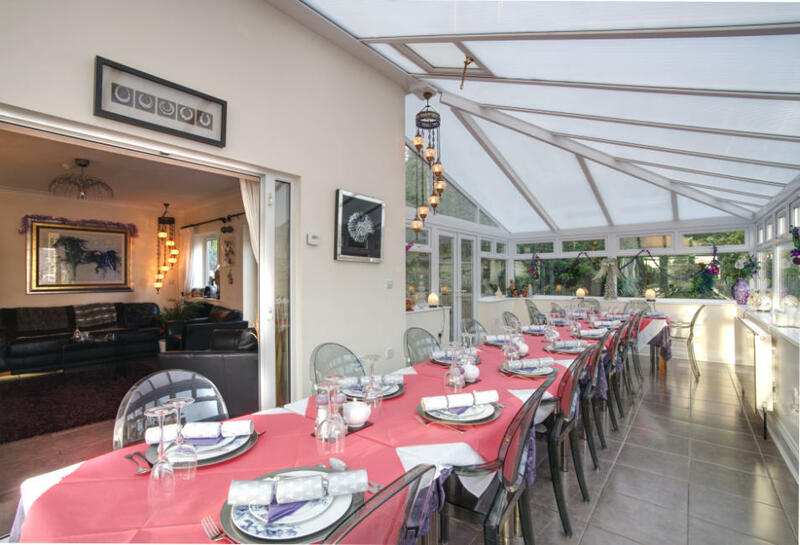 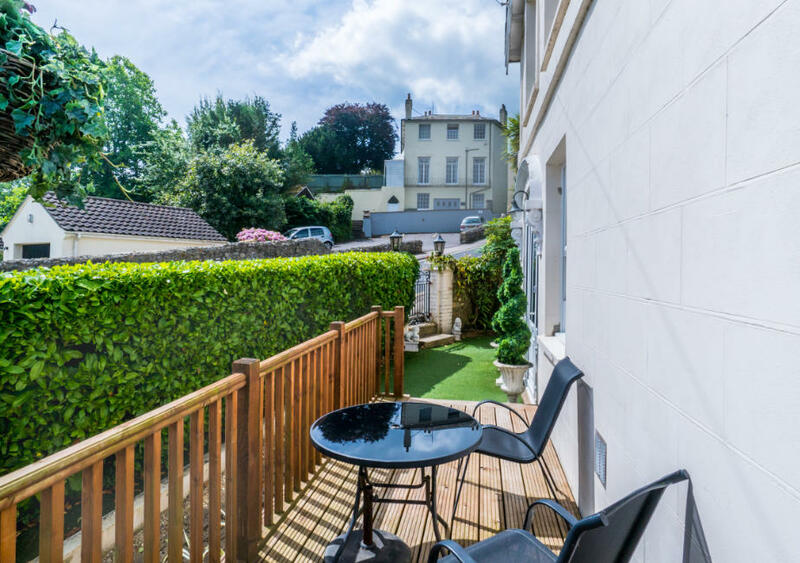 French doors lead from the dining room onto the balcony with further seating areas to enjoy the panoramic views or onto the terrace leading to the garden which has BBQ facilities and additional seating areas. 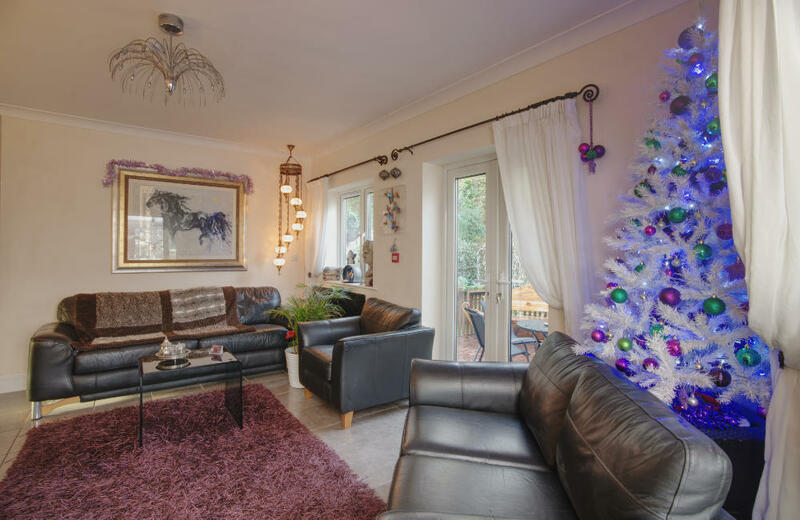 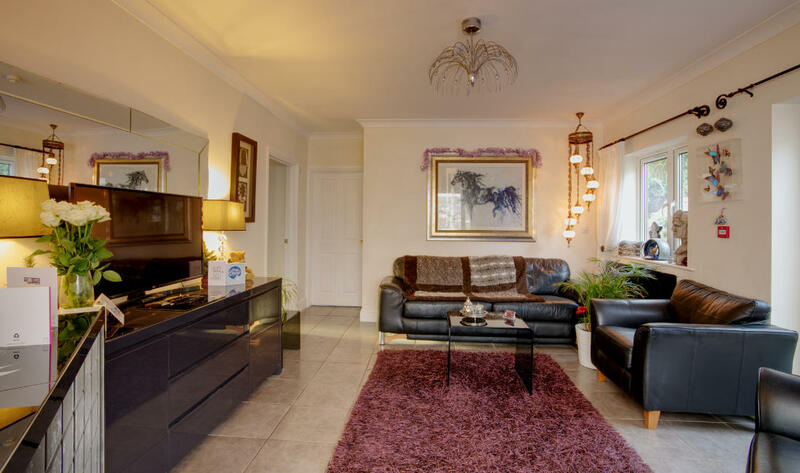 You can relax in our comfortable living room which has a sofas and armchairs with a Freeview 42in LED TV, DVD and WII player, an i-pod docking station with speakers along with a selection of books and games. 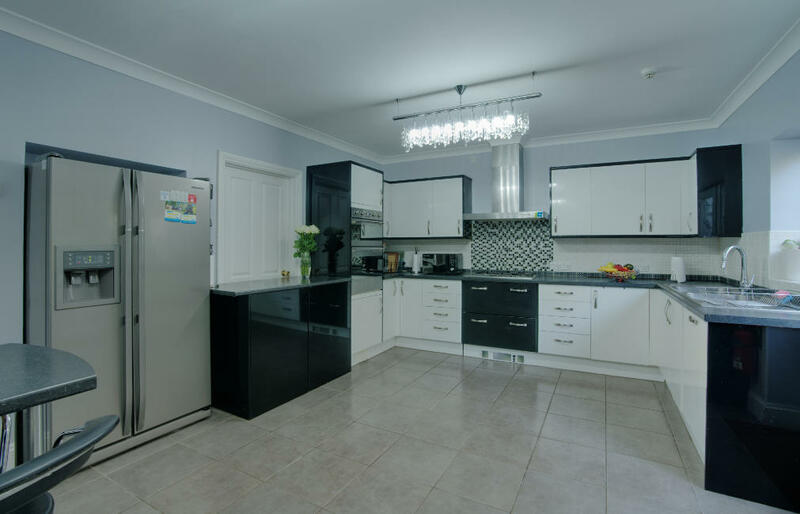 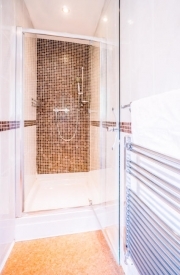 Our modern, state-of-the-art kitchen is fully equipped, and we have a utility room with a washing machine and 2 tumble dryers and freezer. 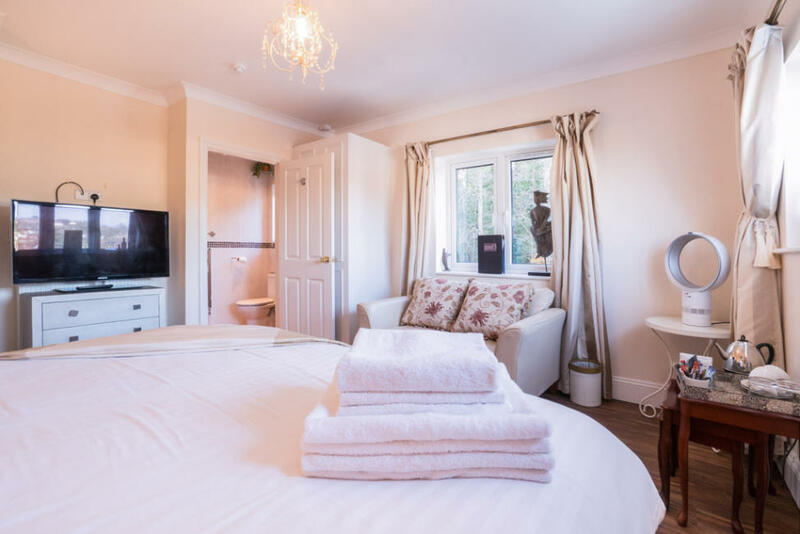 We have wi-fi access throughout the house. 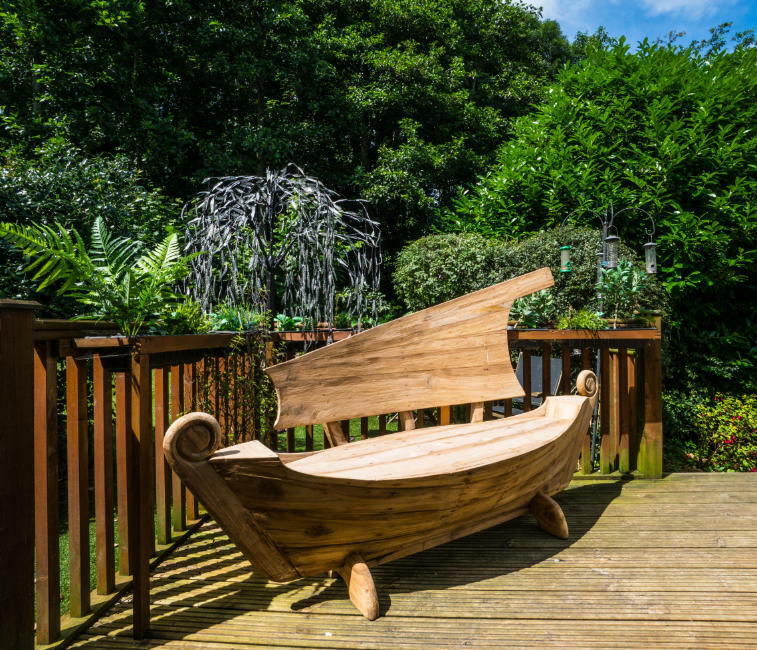 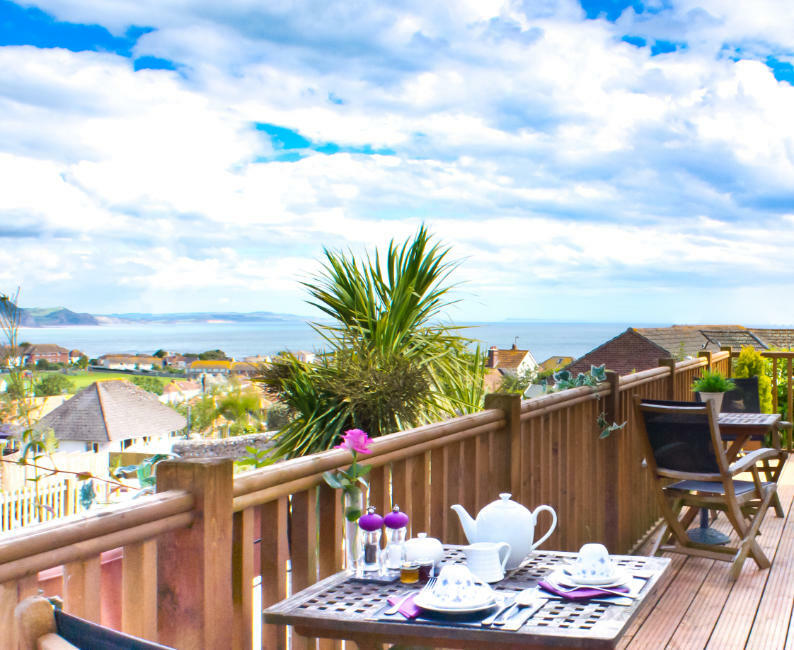 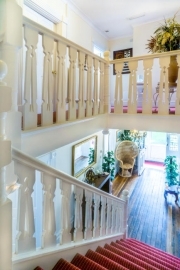 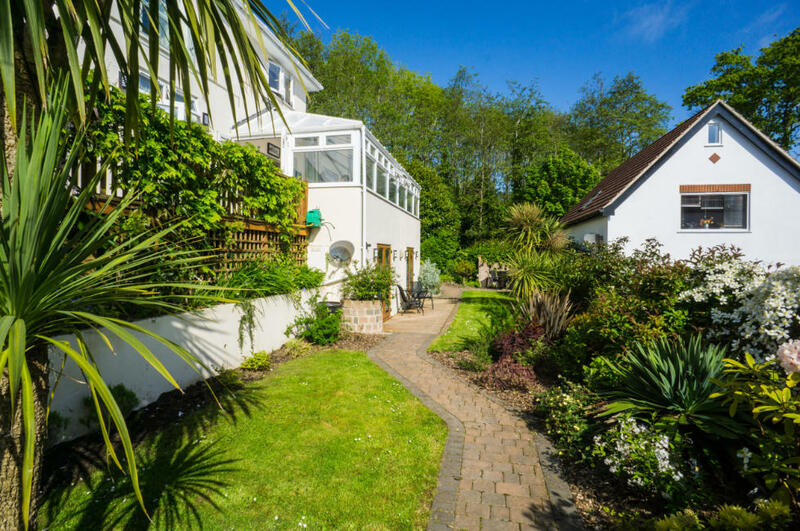 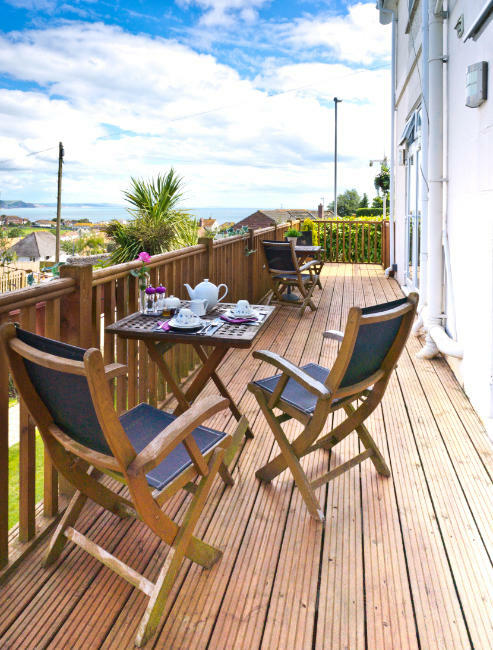 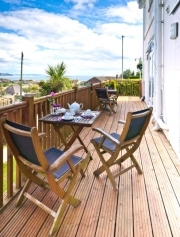 The well established garden has a terrace, patio and lawns, garden furniture and a barbecue. 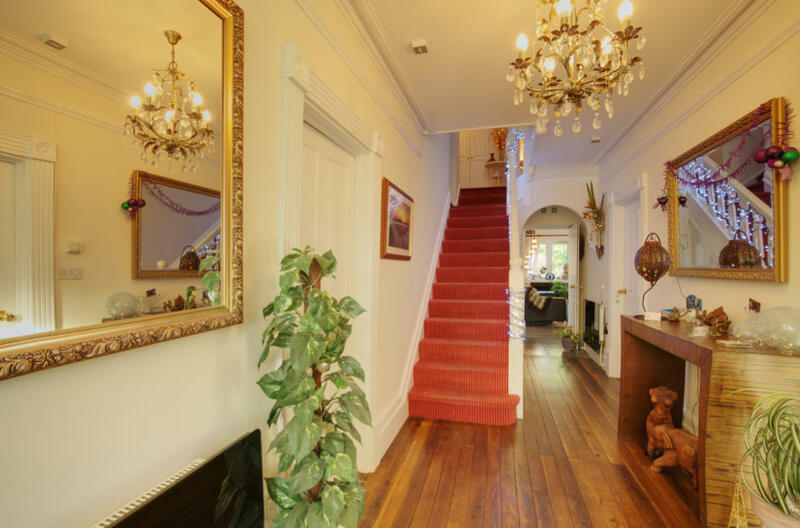 Certain pets are welcome, subject to prior arrangement and permission.